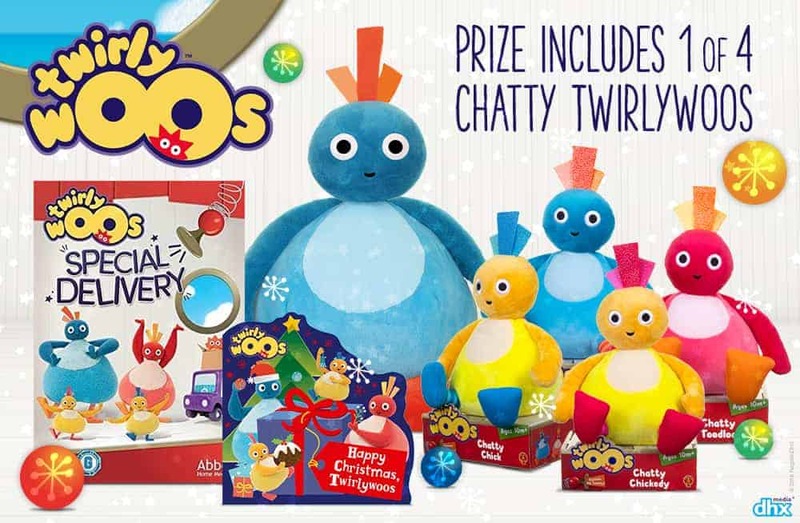 Win a Festive Twirlywoos Prize Bundle! Christmas is coming and what better way to celebrate than with one of these fantastic Twirlywoos prize bundles. Whether at home or on the go, this fantastic product range provides endless opportunities for fun and entertainment whilst helping to develop their physical, emotional and cognitive skills. Talking Great BigHoo from Golden Bear is big, bright, chunky and perfect for cuddling up to this Christmas! This adorable toy says sounds from the programme when your child presses him. Made from super soft and beautifully textured fabric, Great BigHoo makes a lovable companion and the perfect friend to have twirly adventures with. Endless fun awaits with the Chatty Twirlywoos from Golden Bear. With Great BigHoo, Toodloo, Chickedy and Chick to collect separately, these super cute talking toys bring the characters to life. Soft and cuddly with adorable sparkly tufts, press their tummies to hear their funny Twirlywoo phrases. Enjoy a festive tale with your child in this shiny and brightly coloured board book, Happy Christmas Twirlywoos from Harper Collins. And little Twirlywoos fans everywhere can settle down and enjoy their favourite episodes once more in the DVD collection Twirlywoos Special Delivery from Abbey Home Media. To introduce your little ones to the Cry Babies Magic Tears range, Boo Roo and Tigger Too are lucky enough to have three to giveaway. Prize: Festive Twirlywoos Prize Bundle – 1 x Talking Great BigHoo toy, 1 x Chatty Twirlywoos toy (one of four selected at random, toys are sold separately), 1 x Happy Christmas, Twirlywoos book, 1 x Twirlywoos Special Delivery DVD. My daughter loves Chickedy and Chick! Peekaboo, my daughter loves him and gets very upset at the episode where he gets stuck upside-down in a clear teapot! My granddaughter loves Chickedy and Chick. I think it might be the sound of the names that makes her giggle. My nephew gets excited when he sees the Twirlywoos his favourite is Great Big Hoo. My daughter loves Chickedy and Chick. My daughter likes Great Big Hoo! Peekaboo is my grandaughter’s favourite. My 2 year old grandson loves Quacky bird! My two year old loves Chickedy and Chick. Peekaboo is my daughter’s fave! My 22 month old daughter loves watching the Twirlywoos. Her favourite characters are Chickedy and Chick. She’s learnt to say their nanes and she gets excited when they come on as they make her laugh. Chickedy and Chick are our favs. Peekaboo is loved in our house! My 3 year old loves Great Big Hoo! My niece’s favourite is the little sea urchin Peekaboo. we don’t have a fave yet as my niece is the only baby in the family for 7 years & she is just 6 months old so I am entering hoping to get things for her as she gets older. Today she likes Great BigHoo. Tomorrow, who knows. I do like peekaboo because he is a stowaway but my favourite twirlywoo is toodloo because she’s a bit like me and bursts into random dances every so often! Great Big Hoo. The entire range is adorable. I love them! Great BigHoo is our favourite. Big Hoo is our favourite!